Visit the Igreja Colegiada Church on your way through Ourém, Portugal. 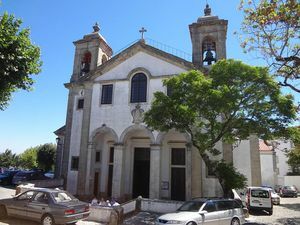 The Igreja Colegiada da Nossa Senhora das Misericórdas Churc of Ourém is located in the city centre of the Medieval villa. The original temple was destroyed during the 1755 earthquake, so its current structure was refurbished at the end of the 18th century. The crypt is the original one and on it can be seen the tomb of the Earl Afonso, made in white limestone and Gothic in style. The reclining statue is a work by Diogo Pires el Viejo. The tombs has an engraving illustrating the emblem of the Earl: “Patience and force together defeat the heaviest workloads”. This single-naved church is divided into eight by lateral arches creating small chapels. The main one has a great 18th century oil painting. The organ was acquired in the Trinas do Mocambo Convent, in Lisbon, in the mid-19th century.